After partying on Halloween, Christmas is the next big shindig, especially here in the Philippines where we take Christmas seriously—too serious, in fact, that our Christmas celebrations don’t officially end until the first Sunday of January when it’s time for the Feast of the Three Kings. 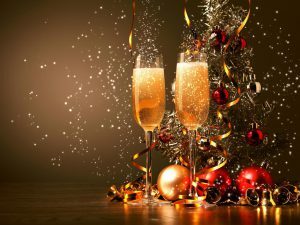 Since the yuletide season is up ahead, we gathered fun ways to put the merry in “Merry Christmas” for your office party! These ideas can also work on other staff celebrations aside from Christmas. Food plays a big part in our culture, it is the highlight of every occasion we Filipinos celebrate. 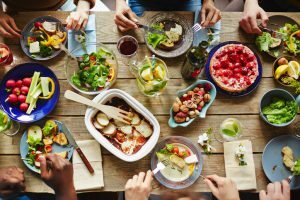 Spice up your party by telling everyone to bring home cooked meals to share, or even push the idea further by setting a specific theme like “Hometown Specialties”, “Family Recipes” or “Food from around the World”. Not only will the company save a lot of money on hosting the party, everyone else will get to try different dishes and have more fun during the meal. 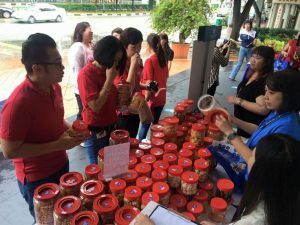 Christmas is also a great time to give back to communities, and adopting a charity is one way to share your blessings and the spirit of the season. Engage your staff to visit an institution and give out food or basic supplies to those in need. The smiles and thanks you get from those you had helped is enough of a reward already, and probably one of the best gifts you will ever receive. Introducing competition is one way to liven up your staff. 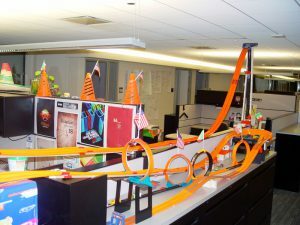 Allowing your employees to unleash their creative sides and then get rewarded for it always results in great fun. Working in groups also fosters camaraderie and strengthens the bond between staff members. Pro tip: make sure the grand prize is worth their effort, it might drive them to be even more crafty! Another good way to make your Christmas party special is by allowing your employees bring family members to celebrate with. The presence of their loved ones will make the party feel more like they’re at home. Since food and family are highly important to Filipino culture, you really can’t go wrong with this option. Hosting an intimate group lunch date in your own office’s party room or a nearby restaurant is a good opportunity to get to know your staff better. You can also ask for honest feedback or encourage casual conversations. If you’re tight on budget and don’t want to spend extra on throwing a Christmas party, you can settle on this one instead and still make it enjoyable for everyone. Part of creating a positive work environment for your staff is doing small things to boost their morale. 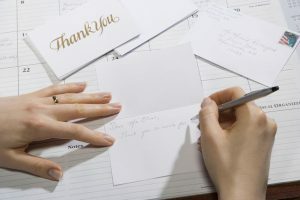 A simple gesture such as writing a letter of appreciation for those who particularly excelled that year can be part of the company’s annual Christmas celebrations. You can also have them write letters for each other that can be exchanged along with gifts. It’s not uncommon to find people whose birthdays land on December 25, or a few days short of it. You can host the office Christmas party alongside someone’s birthday or if the company anniversary falls on the same week/day. It makes the celebration more valuable and special. Not to mention, you can also save on throwing one party instead of two! Setting the company Christmas party as a team building event is also a great way to celebrate the yuletide season. 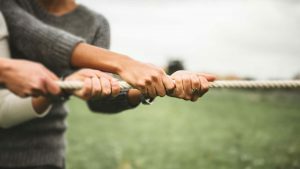 Team building activities bring people together–not only does it improve relationships between employees, it also helps them communicate with each other better. Organizing team building events also provide a platform that encourages creativity with positive reinforcement. You can also add this short program or plan your Christmas party around a year-end awarding ceremony for the year’s most outstanding staff members. Acknowledging people’s hard work and excellent performance motivates them to keep on doing better. Bumping up the award with an additional prize is optional, but it would help the title mean more. These are just a few suggestions that you can use to spice up your office parties and make the workplace feel more like a home. 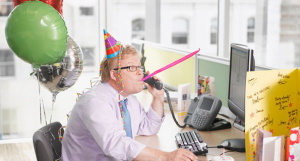 Having a good party that everyone can enjoy is a wonderful opportunity to bring your staff closer to each other and together contribute towards creating a harmonious environment in the office. Work shouldn’t just work, you can have a little fun too!